I was born wearing glasses. The full head of hair, the colic-y cries and the thick plastic framing my unopened eyes made me easy to pick-out from all the newborns in the hospital’s nursery. “That one is ours!” It made for an interesting delivery story. 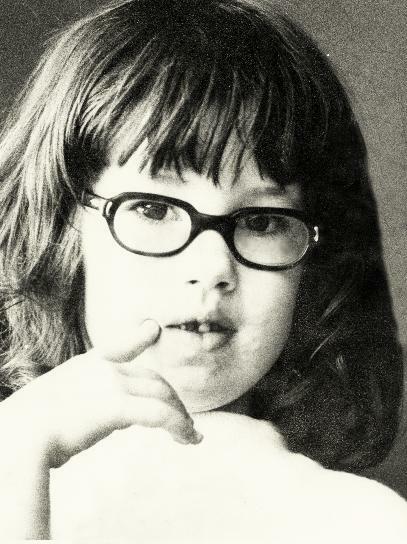 I had my first eye surgery at age 2, the second at 4 and the third at 9. In fact, by the time I reached 20 and my fifth surgery (albeit the final two weren’t eye related), I had enough surgeries to feel like the hospital was just our family’s poor idea of a fun get away. Sure, I hadn’t been to Disney World, but I had this marvelous get away to St. David’s Hospital where I played a rousing game of checkers with my nurse while nibbling on bland Jell-O. Now who’s envious? You’d think that by now, I’d handle glasses more gracefully. You’d be wrong. Thanks to some perverse label maker who decided that printing important things like “Directions” or better still “Warnings” in a 5 pt. font was cool I had the pleasure of visiting my ophthalmologists recently. Thank you perverse label maker. I had been quite happy with my 20/30 vision for years now, but 5 pt. font labels were now fuzzy black squiggles. They probably only said “don’t take 100 of these at once” or “don’t lick this” if I could only read them. After a few tests, where my spunky little doctor made my eyes do some tricks. (Thanks to those early surgeries my eyes make for an interesting study), she cheerfully declared, “it’s time for bifocals!” Yay. Go me. I asked what my vision was and got the good news, “your distance is 20/30, but up close it’s 20/70.” I complained bitterly about the unfairness of it all and pointed out my husband’s 20/15 vision. Apparently, his good vision has no impact on mine save that he can read all the small words without aid. Show off. She consoled me with, “now you can get rid of the magnifying glass.” My Sherlock Holmes impersonations, too I suppose. I pouted. It took a month to get the prescription filled. The eyeglass sales person promised I would hate them for weeks – they might even give me headaches. Headaches you say? Sign me up! She finally added, “well, it may not be that bad.” Needless to say, when they called to announce my glasses were ready, I dragged my feet. If they’re ready on Saturday, they’ll still be ready on Wednesday I reasoned. I went with the progressive lenses, because yes I’m vain enough that I don’t want a line across my eyes. A line announcing to the world my eyes were even more special that originally thought. That was beyond my ability to cope. I’ve had no trouble adjusting to them. No feeling like my feet are 100 miles away while going down stairs. No headaches. I can even read all the small words as promised; however, I’m still not overly keen on them. Sure, you can’t tell they’re multi-focal lenses, but I know and deep down the world knows, too. Since I’m apparently stuck with these forever I have only one request. Well, if you don’t count being used as plant fertilizer. My request is that when I drop dead could someone finally take these things off my face. Feel free to cast them on the ground and do a little dance atop the lenses on my behalf. Yes, I’m still in the adjustment period. This entry was posted in Me, Random Thoughts and tagged glasses, progressive lenses.